SSC is the largest ministry organization in India which provides lots of job to youngsters. Every year SSC conducts CGL, CSHL, JE, STENO, and other exams. If you are dreaming to going the post of LDC (lower division clerk), JSA (Junior Secretariat), PA (Postal Assistant), SA (Sorting Assistant) and DEO (data entry operator), then SSC CHSL is the best way to fulfill your dreams. SSC CHSL is the secondary level (10+2) exam. The candidates should be higher secondary and Be Searching a government job then SSC CHSL is the best option for them. In this blog, I am telling about SSC CHSL Notification 2018, Calendar, Syllabus, exam pattern, eligibility criteria and other useful information. Now you can get new SSC CHSL Notification 2019 with complete eligibility and post details. The candidates who are waiting for SSC CHSL 2018 Exam, that is good news for them. SSC has announced the SSC CHSL exam calendar and related important notifications. Before you are appearing for SSC CHSL Exam 2018, you must have to information about SSC CHSL online application form, syllabus, SSC CHSL exam pattern, SSC CHSL eligibility, SSC CHSL admit card, SSC CHSL result. These basic points play important role in your SSC CHSL exam 2018 preparation, for your convenience, I am explaining these points. SSC is soon going to conduct examination for the post of LDC (lower division clerk), JSA (Junior Secretariat), PA (Postal Assistant), SA (Sorting Assistant) and DEO (data entry operator) as per the updated SSC CHSL notification 2018. Those candidates who are waiting for SSC CHSL exam 2018, it is good time to prepare for them because SSC has released SSC CHSL exam calendar 2018. According to SSC CHSL exam calendar 2018, SSC CHSL online form will start on 03 Nov 2018 and the last date of SSC CHSL online form submission is 30 Nov 2018. According to SSC CHSL notification 2018, SSC CHSL has released online application form date. 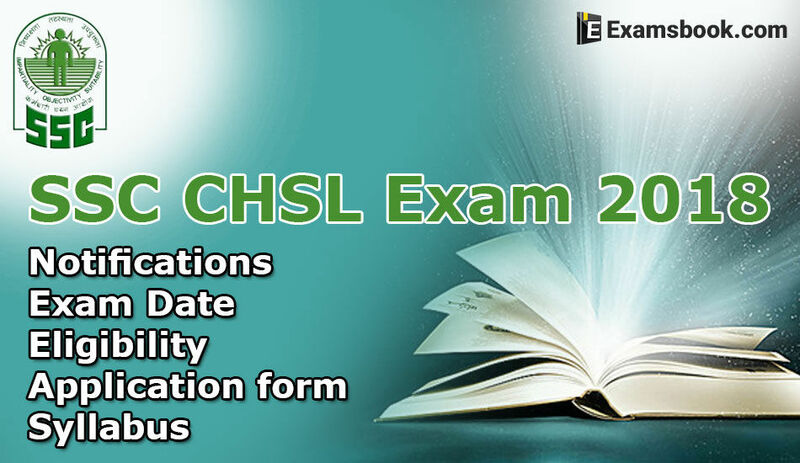 you can know the process of fill the SSC CHSL application form 2018 step by step on this blog. SSC CHSL Online process is divided into three parts – Part 1, Part 2 and Part 3. Part-1 is the first step of online registration. In this part, candidate generates an ID and Password. The Candidate logs in part-2 through generate ID and password. The candidate selects the center name, category and other details in this part. In part-3, candidate pay fees via online mode or offline mode. You will have 100 rupees as application fees. SC / ST / Women / Ex-servicemen are eligible for reservation exempted fees. Admit card is necessary to enter examination hall and attempt the exam. SSC provides SSC CHSL Admit card a week before an exam. If you want to get your admit card then you should know your central region. SSC CHSL includes nine regions Eastern Region, Kerala -Karnataka Region, Southern Region, North Eastern Region, Western Region, Madhya Pradesh Region, Central Region, North Western Region, Northern Region. You can download admit card region wise (for your region) by visiting SSC CHSL Admit card on the official website. If you have any problem to get admit card then Immediately contact your nearest head office. If you want to know the process of getting SSC CHSL Admit card then you should read SSC CHSL Admit card 2018. If you want to achieve your goal in the SSC CHSL exam 2018, then you should understand the SSC CHSL Exam pattern 2018. SSC CHSL Exam pattern provides a clear vision about the division of marks and question. Every subject includes 25 questions and every question carry 2 marks. There is negative marking of 0.5 marks for each wrong answer. SSC CHSL Tier 2 is pen and paper mode exam. It includes letter/application and essay writing. Every question carries 50 marks and total marks allotted 100. The minimum qualifying marks are 33 percent of total marks. SSC CHSL tier 3 is known as skill test and typing test. The skill test and typing tests are of qualifying nature. The SSC CHSL syllabus gives an idea what type of question comes in the SSC CHSL exam. If you want to get good marks in SSC CHSL exam then you should be complete information of SSC CHSL syllabus. SSC CHSL syllabus 2018 has divided into 3 tiers. SSC CHSL tier 1 has divided four-part general intelligence & reasoning, general awareness, quantitative aptitude and English comprehension. SSC CHSL Tier-3 syllabus has basic computer knowledge and typing test. Before applying the SSC CHSL Online application from you should get all information of SSC CHSL Eligibility criteria 2018. SSC CHSL eligibility criteria 2018 has consisted of age eligibility, education eligibility, PWD (person with a disability) eligibility, nationality eligibility. Candidate must have 10+2 (higher secondary) certificate or equivalent examination certificate from recognized board or university. As per SSC CHSL notification, the candidate should have a minimum age limit of 18 years and maximum age limit should be 27 years. Age relaxation allows for SC & ST, ex-serviceman, PWD and women. If you get more details about eligibility criteria then you click on SSC CHSL eligibility criteria 2018. The candidates who attempt exam they eagerly await her expected result, answer key and cut-off marks. SSC consist of three tiers – Tier 1, Tier 2 and Tier 3. SSC declare the results, cut-off and answer key of each tier separately. Cut off is the fixed limit of marks you need to score in the exam. The candidates who have participated in the SSC CHSL tier 1 exams they can expect to be the SSC CHSL Tier 1 result declare in May 2018. SSC CHSL will declare results for all nine regions separately. You can download your Results, cut-off marks and Answer Key by visiting SSC CHSL Result 2018. In this blog, you can check complete details of SSC CHSL online application form, admit card, exam pattern, syllabus, eligibility criteria, result and answer key & cut-off marks. I have explained my best informative Knowledge about SSC CHSL which is useful for upcoming SSC CHSL Exam 2018. If you have any quarries regarding SSC CHSL Exam 2018 you can ask me in the comment box. Plz Like and share with your friends.